How Borough Archivists and Local History Societies might respond to the disks. might respond to the web site. Archivists want to make their material available to their readers and, at the same time, to protect it from over-use and damage. They might like to encourage local history groups to create copies of this rare material for public use. One photograph of each document would be enough to save it from wear. Much of this work has already been done I am sure. The old Borough of Stoke Newington is about two square miles in area and contains one Secondary school and about nine Primary ones. This seems a convenient area for intense study. Hackney, which has now absorbed Stoke Newington, must contain half a dozen similar patches. So must Westminster, Camden and Haringey, each with its quota of schools and special interest societies. Some of them may be interested in producing their own very local histories. It will be haphazard. Nobody will force schools to produce a disk but if they do, they will need help. 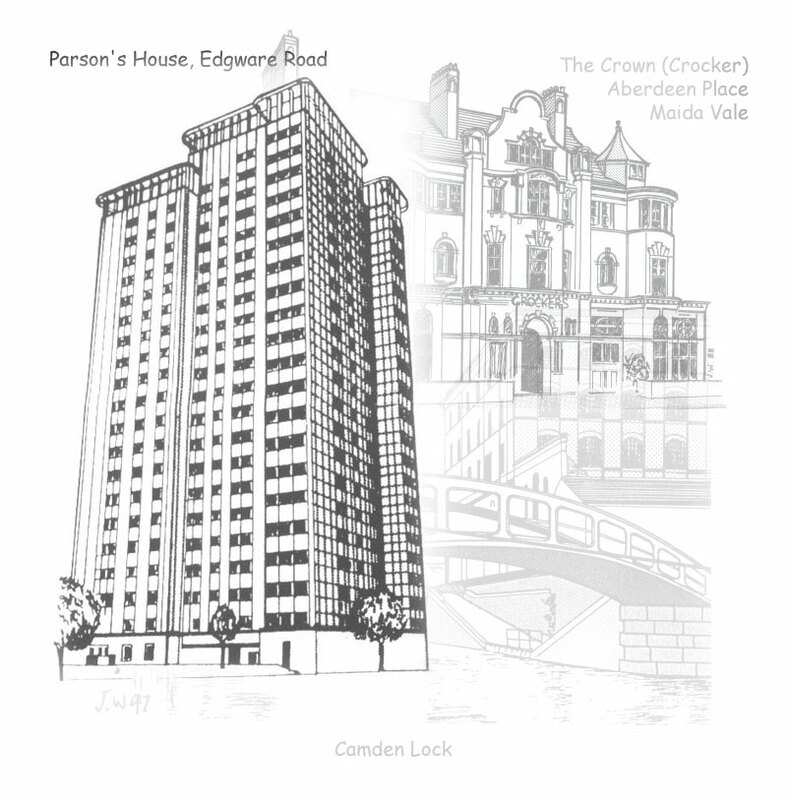 In Marylebone and Paddington, Camden and Muswell Hill, people may like to view my books, as I have put my Growth of Stoke Newington, The Growth of Camden Town, Growth of Muswell Hill, and The Glacial Drifts of Muswell Hill and East Finchley on the website. This would make large amounts of information, maps and drawings readily available and encourage schools to download pieces which are relevant to their own neighbourhoods. Archivist would be able to suggest other texts which could be milked. A set of maps of perhaps two square miles, which others can use easily and extract small patches. Godfrey’s half- scale Ordnance Survey maps are invaluable and extremely cheap. They have been the mainstay of the Local Historian for years. However, there are other less well known maps which can be used. Examples of these can be found in the Introduction above. There are also many others which are rarely seen, hidden away in archives. Years ago I was trying to find a map of the Grand Union Canal at Paddington, but before the Regent’s Canal had been started. We searched every map we could find so that the tables were covered, but every map showed either no canal, or both the Grand Union Canal and the Regent’s Canal, with the triangle of Little Venice already cut. At last, after at least half an hour we unfolded a pristine map by Faden dated 1810. It had rested in peace for nearly two centuries and the colours were bright as new. The map showed the Grand Union at Paddington but not the second canal. Work began on the Regent’s Canal in 1811 and it reached Camden Town by 1916, so the Faden map shows a very brief point in Paddington’s history. 1810 Faden map showing the Grand Union Canal at Paddington before Little Venice was cut. London street patterns often appear to be chaotic. In America, where they were building on virgin land, the grid iron street plan is king. In London , which has been farmed for thousands of years, everything depends on the old field shapes. 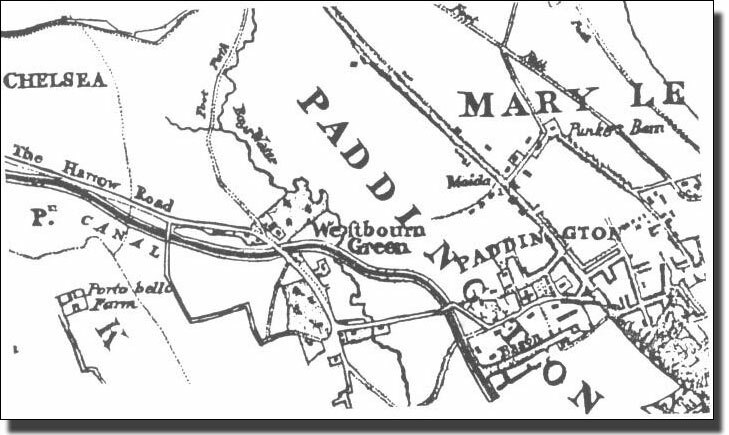 The 1816 Westbury Farm plan used to be in Westbourne Green but was soon engulfed with houses when the Great Western Railway arrived at Paddington. The old field paths are today major roads. 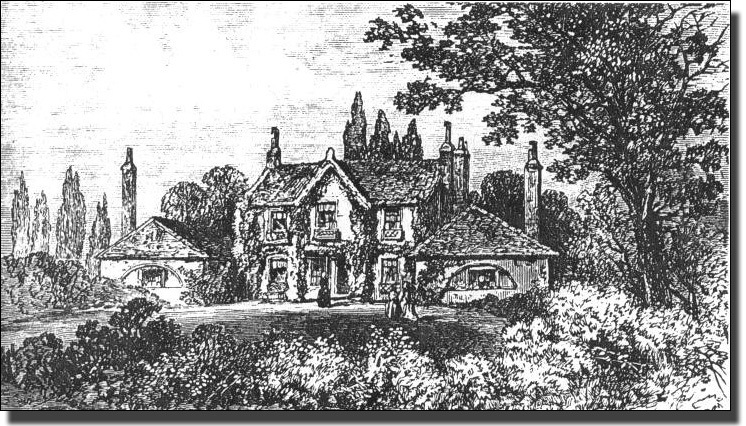 Mrs Siddons’ house at Westbourne Green c. 1800. 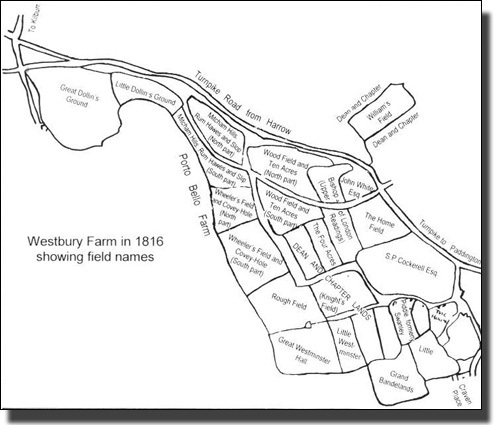 Old Estate maps and field patterns can explain many puzzles. Sale Documents similar to the Stoke Newington ones in this disk can be copied all over London. 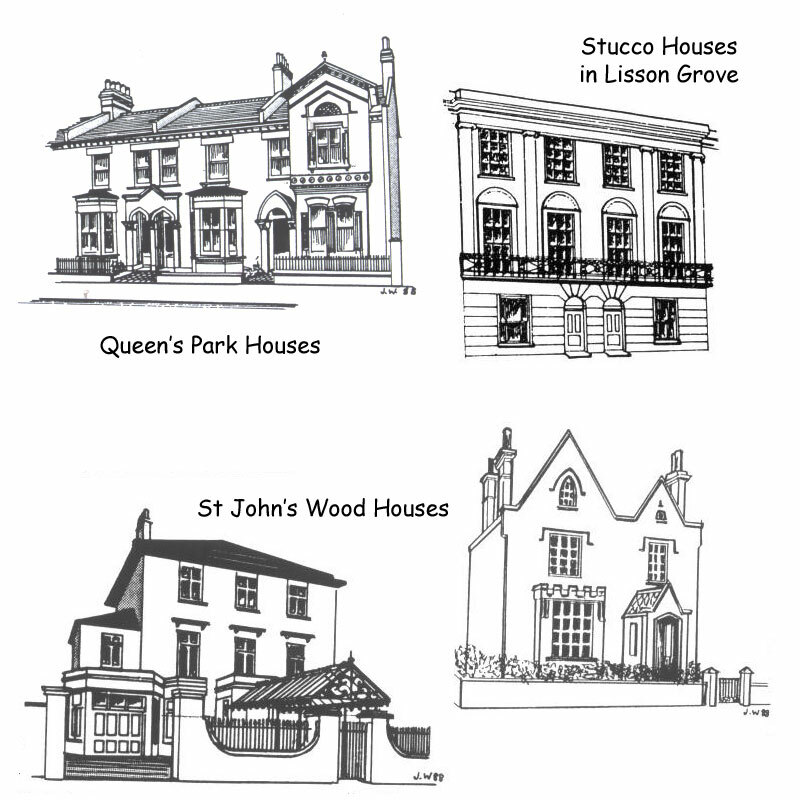 Information on Estates in Stoke Newington. 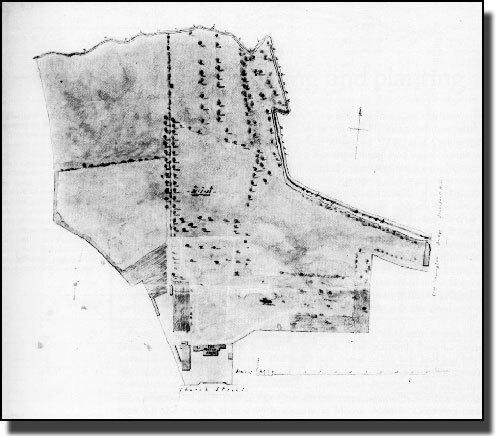 Old Estate Plans like this are invaluable. It is difficult to realise what a barrier the Hornsey Lane Ridge was before the Archway Road was cut. Today Archway Road is a long uphill slog but before the new road the ridge blocked off all travel directly north. One had to go via Crouch End. This picture makes everything clear. Archivists know about pictures like this and can ferret them out.